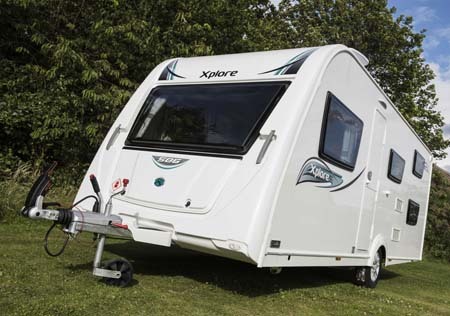 Six-berth tourers really do deliver when it comes to caravanning for the whole family. We’ve picked six of the best. 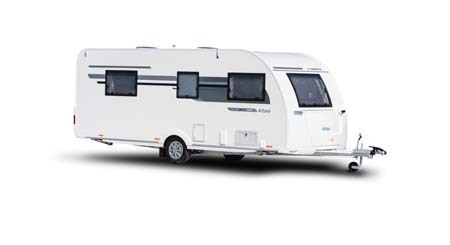 Family of up to six and you still want to go caravanning? Not a problem. All the main manufacturers with a presence in the UK have something to offer you. Of course, just because you’ve got six sleeping berths doesn’t mean you actually have to use them. Families of, say, four will appreciate the extra flexibility of a ‘van designed for up to six folk. There’s no reason couples shouldn’t wish to make the most of the extra space of a larger, multi-berth unit either. Here, we’ve gone for six of the best single axle models, all of which retail at comfortably under the £20,000 mark and, just as importantly, show a determination to keep things as light as possible. But, do note there’s a decent choice of six-berths on twin-axle chassis out there, too. Think loads. The larger the family, the more gear you’re going to want to take with you – so the more important your payload allowance becomes. Note, also, any fitted extras – stabilisers, locks, TV systems and more – will also shave your overall payload allowance. Storage is another key consideration. Make sure there’s plenty of locker and underseat/bed storage space for all the family’s belongings. Can your car cope? It’s not just a question of getting your car to caravan weight ratio right, you might also be expecting your towing vehicle to carry more gear. Kitchens count for more when it comes to families. It’s not just about equipment, although a proper cooker with oven and grill – possibly also a microwave – and a bigger fridge/freezer will always come in handy. You’ll want worktop and storage space to complement all this, too. Washrooms can be more critical, too. Although the chances are you’ll end up using campsite facilities in this respect, it’s sometimes easier to cope with small children in the ‘van’s washroom. Make sure it’s up to the job. An awning can make even more sense when you’re catering for a larger family. Don’t forget to budget for one, and make sure you have the space and capacity to carry it with you, either in the car or the caravan. There’s definitely a modern twist to the interior styling of this ‘van, which boasts the usual Adria GRP-clad bodywork etc. With an MTPLM of 1,420kg, there’s only a 160kg payload. 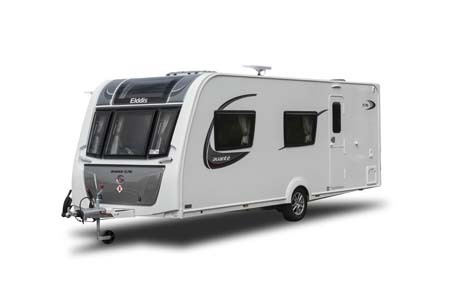 However, the chassis can be upgraded to 1,500kg – that might be worth considering, especially if your order your Tamar in seven-berth trim, with a third bunk added in the rear offside. Elsewhere, the beds are two bunks from the central dinette and a transverse double from the lounge settees. Flat (as opposed to curved) furniture is often an indicator of a lower price level, but here it simply adds to a rather modern, clean-cut interior. All-round build quality is a cut above the norm, too. The latest Tamar also comes with the Anniversary Pack, which includes everything from AKS stabiliser, to ambient lighting, to electric as well as gas Truma heating, plus lots more. One item it doesn’t get is a microwave oven, although the wiring is in place for a subsequent fitting. There’s also another six-berth in Adria’s Altea line-up. 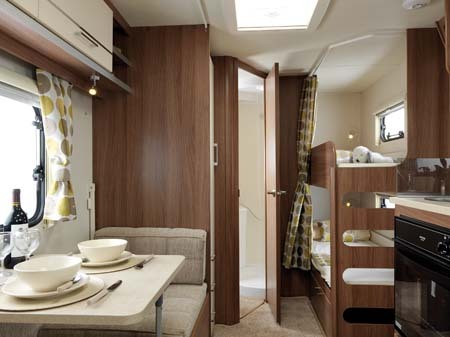 The 552DK Severn puts a dinette next to the bunks. There’s an excellent specification here, with everything from the Sky-scape sunroof to AKS stabiliser, and ATC trailer control system to 800Watt microwave oven as standard. 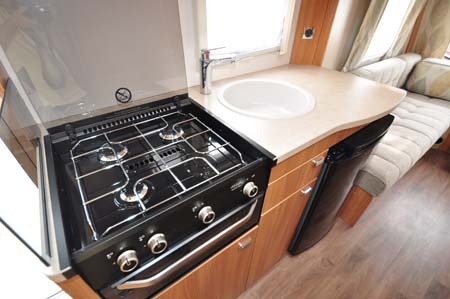 There’s also a full Thetford Aspire cooker with dual-fuel hob and separate oven and grill. Even alloy wheels make it onto the standard kit list here. 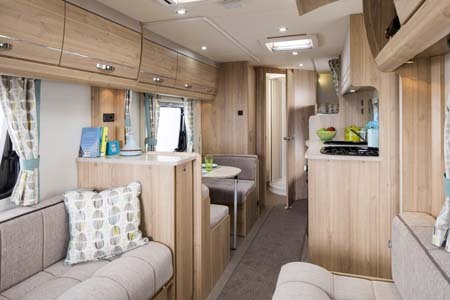 There are bunk beds in the rear offside corner, while the front lounge offers up twin singles or a generous 2.08m x 1.49m double. But the 576’s key feature is likely to be the nearside mid-‘van double dinette offering mealtime seating for up to four and, in turn, creating a small double bed (rather than the usual bunks in such an arrangement). There’s a 172kg payload on the standard 1,440kg chassis, although it can be uprated to 1,500kg. Watch out, also, for selected dealers’ special edition versions of the Avante 576. If you think Sprites represent great value, check out the Freedom models, all three of which are six-berths. The FB is a twin axle, while the standard 6 is 7.25m long and puts bunk beds opposite an offside washroom at the back. 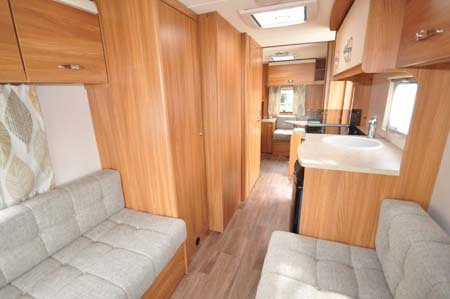 But, our pick of the bunch is the longer 6 TD, with its front lounge that’s large enough to convert into two single beds or a double at night, while the back end is a mix of bunk beds and seating (that also converts to beds) – enough to give the kids room of their own, away from the rest. 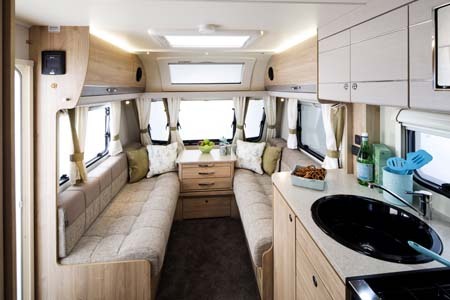 It’s a single front window design and what you don’t get are the sunroofs and large rooflights that more upmarket tourers boast. Instead, though, there’s seemingly more locker space – a real boon for the whole family. There’s a bit of compromise elsewhere. Cooking equipment is pared back to a three-ring hob and grill (a microwave oven is a £165 option), for example. And the washroom, although spacious enough for a separate shower area, only gets a curtain divider. MTPLM is 1,350kg, which leaves a 180kg payload. Lunar has had some success with the Venus brand since its introduction as a lower cost alternative range some years ago. 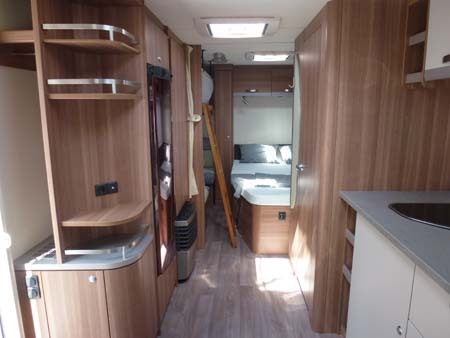 The 580/6 joined a growing line-up in time for the 2015 season, and it’s a slightly different take on the usual rear bunks/washroom in that the beds are along the nearside. Total length is 7.36m and parent company Lunar has leant on all its lightweight expertise to bring you an MTPLM of 1,380kg and a payload that tops 200kg. Do consider the Plus Pack option, though. It’s £499 and includes alloy wheels, AKS stabiliser, spare wheel and Al-Ko Secure receiver, as well as the luxury of a microwave oven and a stereo radio/CD with MP3 player. Or, if you want a slightly more stylish – and therefore pricier and heavier – take on a similar theme, have a look at sister model Lunar Quasar 586. 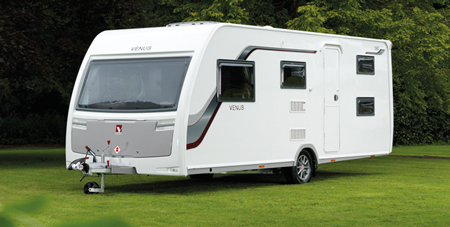 With parent company Knaus currently in the throes of setting up a UK-wide dealer network, it’s worth checking out the imaginatively different offerings of its budget brand, Weinsberg. 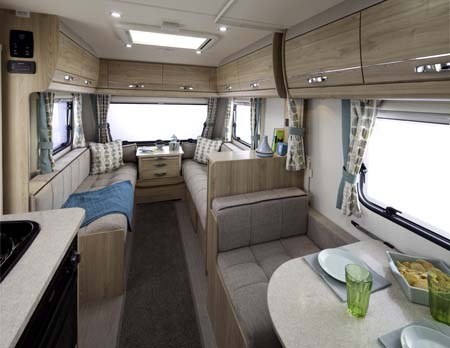 The CaraOne 55UK is a prime example, with exterior styling that’s distinctly European and a floorplan like no other. There’s U-shaped seating at the front while, at the back, there’s a cutaway double bed immediately next to two bunks, complete with clever integral ladder. It makes for an ideal arrangement if you really want to have your kids close to hand at night. Or, you can make a double from the lounge seating at the front if you prefer a bit of distance. The kitchen has plenty of storage as well as a stainless steel basin, a flush fit three-burner gas hob with glass top, and a 110-litre fridge sits opposite. A hefty 1,600kg is the only thing that really counts against this well-built tourer, although it does give a 220kg payload. 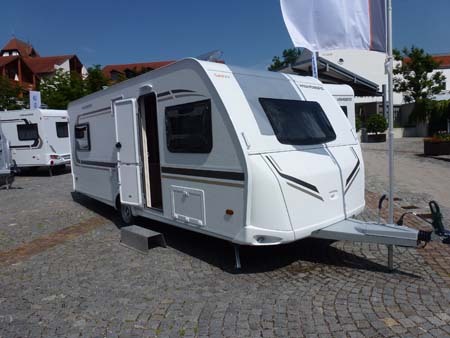 With two six-berths in Elddis’s wallet-friendly Xplore line-up for this season, here is the slightly heftier, slightly pricier 586 that was a new model for 2016. Again, the difference is at the back end, which is shared by two bunk beds and the washroom. 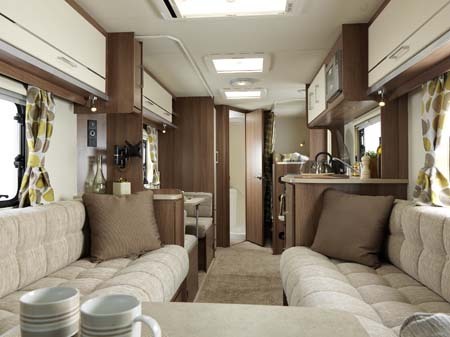 Mid-‘van is a dinette on the offside, which converts to two more bunks in the traditional manner, and a generous run of kitchen along the nearside. You’ll struggle to find a model out there without the £420 SE Pack, but this brings you a stabiliser, wheel lock receptor and spare wheel – frankly, the kind of items that should be standard, especially when you consider this is a ‘van you want the whole family to feel safe and secure with. Elddis certainly doesn’t stint with the construction of its Xplores. Like its more upmarket Elddis and Buccaneer stablemates, they all use the latest SoLiD bodywork construction that extends to a protective GRP underside. Other key features include Whale heating and hot water, a three-ring hob with combined grill and oven (a microwave is extra), 110-litre fridge etc. Overall length is 7.29m and the starting payload is 173kg. 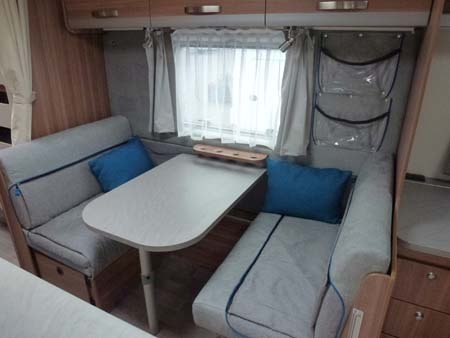 Got any advice or information on six-berth caravans to pass on to others? Feel free to add your comments below. 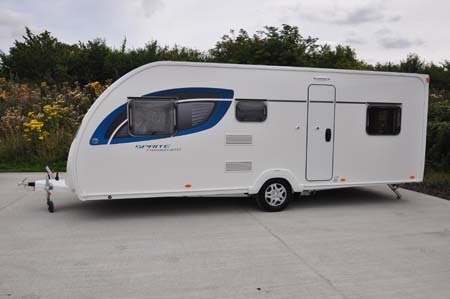 We bought an avondale dart 556/6 for our first caravan, we have 2 kids and the space is essential. Great weight of 1500kg and also single axle. There’s bargains out there to be found. Best caravan we have seen ,liked it that much we brought one. Which one did you buy Terri?